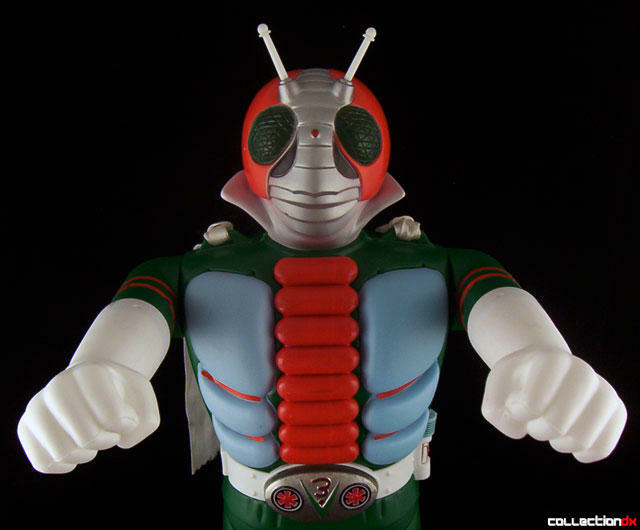 Kamen Rider V3 aired for 52 episodes in 1973-1974 and the Jumbo Machinder was released in 1973. It was the second figure in the line, following on the heels of Mazinger Z and this designation is actually noted on the front of the box. The box is also interesting for the fact that is shows the prototype of the toy and depicts it with a missiles launching hand, which of course it does not have. Although it does not have a missile launcher, this Jumbo does have a few interesting features. First off, it has retractable antennae protruding from the soft vinyl head. Secondly, a white scarf is tied around a hoop on either shoulder. 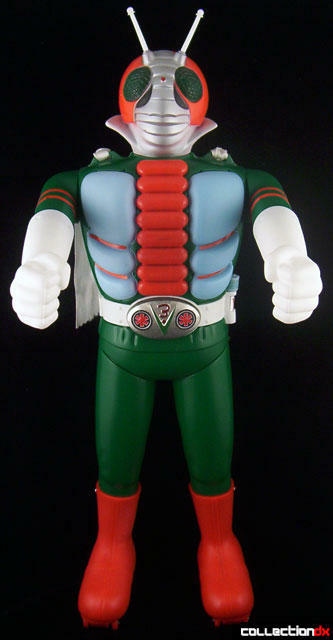 The only other Jumbo to feature a similar gimmick is the follow-up character, Kamen Rider X. His scarf is different, but these two are the only Popy Jumbos to have a cloth accessory. He also has a belt with a tin plated buckle on the front and a holder for what appears to be a flashlight on his hip. Now, it seems you can remove the belt, but it sure looks like a pain in the neck to do it. The only reason I could even think that you would want to do it is so that you can free the flashlight (which is otherwise trapped in place), but even if you did that, it's not like he can hold it anyway. All these parts should probably be considered purely decorative. Both Kamen Rider Jumbos share the same mold on the hands and feet (although Kamen Rider X has holes in his hands to hold his whips.) 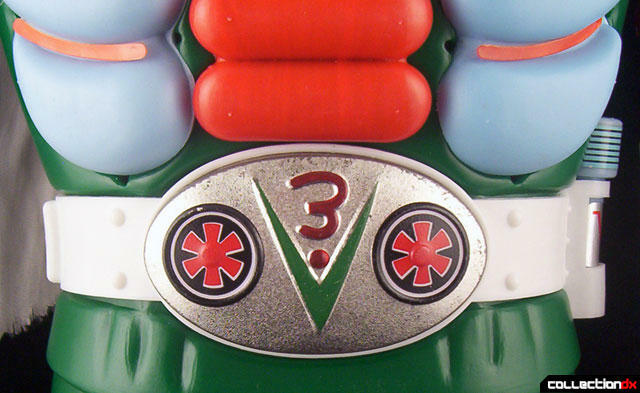 Kamen Rider V3's chest details are molded pieces of plastic with the exception of the red stripes within the blue, which are just stickers. Pay careful attention to that if you are looking to buy one of these. It's easy to overlook a missing sticker here. There is at least one known variation for this guy. Most specimens have a plain, unpainted back of the head, while others have silver paint extending back from the front. Otherwise, this toy is typical of most Jumbos with removable hands (if you want to buy the missile accessory shown on the box), wheeled feet and minimal articulation. One thing to keep in mind though is that with the antennae fully extended, V3 measures 25" tall, a full inch and a half more than typical Jumbos. This could come into play if you are building a display case for your collection. Keep in mind you'll need a little more room for this guy, especially since he looks much better with the antennae out as opposed to in. 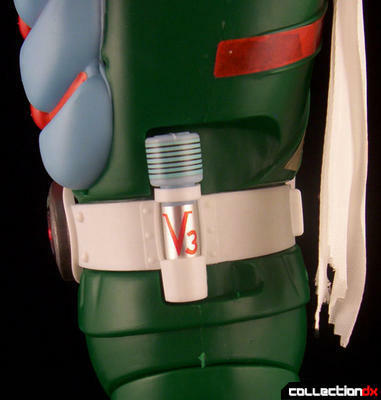 Kamen Rider V3 is a pretty nice Jumbo, but if you have big plans for your collection, it's probably one you can hold off on while you track rarer toys. Although it's not very common in the US, this guy is actually a pretty easy acquisition in Japan. Loose specimens abound and boxed ones do show up fairly regularly too. Unless you just desperately need to have this toy for some reason, I'd suggest you wait until you see it for the value and condition you're most comfortable with. "I had a choice, buy a new car or buy a Jumbo Machinder Green Ghost C3...it really wasn't a hard choice to make." Y'know, I have much respect for Jumbos even if I don't consider myself a major collector of them (I only have about half a dozen). Previously, I'd never really considered the human tokusatsu heroes as worth getting...all giant robots for me. This one, however, is just gorgeous! It may have converted me!